Ruthiebear (Titusville, NJ, United States) on 4 July 2017 in Transportation. For all who celebrate Happy 4th of July! Good compo to celebrate your 4th of July, happy independence day! A superb image for today. I hope you and your family have a great day. Very nice shot for the day ! Espectacular vista, con hermosos colores y luz. ***** Felices días. Excellent detail image of Independence Day. Beautiful and suitable for this day, happy 4th of July. Superb framing . Happy Independence Day to you ! Superbe, bon 4 juillet!!! Bise, bon mardi tout en douceur! An excellent picture for the 4th. Have a great day. That is a very interesting "hot" edit. Hope you have a great Independence Day. I wish you a very great July 4th! Have a happy July 4th! A beautiful image for the day. Happy July 4th! Beautiful bright picture! Belle image pour célébrer ce jour ! Happy Independence Day Ruthie ! Beautiful colors captured from this float! A fabulous image! Spectacular color! Happy Independence Day Ruthie! I hope you had a wonderful day! 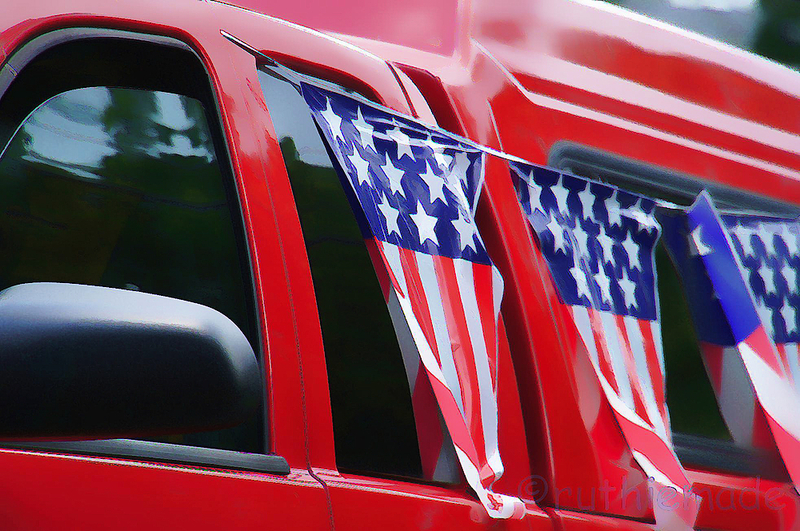 The flags framed by the red truck look terrific. Hope the US had a nice day, thoughts for you in this moment.